Pam Edwards became a survivor of suicide loss on September 29, 2014 with the death of her 17-year-old son, Ryan. This tragedy has provided the motivation to speak up about suicide prevention and mental health awareness. Pam Edwards is native of Arizona; she was raised in Mesa and has lived in North Phoenix for 25 years. In January she celebrated 30 years of marriage with her husband, Dana. They have four children and one son-in-law. Pam holds a Bachelors and Master’s Degree in Elementary Education but she’s proud to have held the job title of “stay at home mom” for 25 years. In the last 10 years she has also worked as a substitute teacher and spent a great deal of time volunteering. 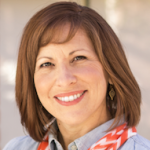 Pam has been a member of the DVUSD Interfaith Advisory Committee for more than 6 years and held a variety of leadership positions in the LDS church in the Young Women’s and Seminary programs. “After Ryan’s death I felt a great desire to take this heartbreaking experience and make something good come of it. The You Matter message resonates with me as I embrace opportunities to educate others on how to create the life they desire and lend a hand to others along the way. I strongly believe that everyone can be the bridge to help for another person.